EDITED I had to change this subject line, see the October 6th 2011 post, further-down this thread, for the entire story. This extra bit of info is important, before you try any modifications, so I'm adding it to this first message. If you use a dual-core CPU, and PCIe x16 (@ x1) Graphics Card, you'll also need a better power pack. soldered directly to the motherboard trace pattern in 4 separate areas. and I didn't want the PSU operating at it's near MAXIMUM rated value all the time. The graphics card doesn't need to be fancy. Any simple PCIe x16 that doesn't need a separate power connection thru another power-supply cable link. but it won't matter on the T5730 to have such a fancy graphics card when just x1 is used. be very careful cutting down that back area of the socket. stay as close to the outer area of that plastic as you can while cutting away the plastic, to open the slot. You can also use a plastic "spacer" to stabilize the graphics card against the motherboard. Don't expect great fast 3D rendering, since just x1 PCIe line is used. But for playing HDTV, it seems x1 PCIe is very smooth moving, and all that's needed. or just try it's own balanced default first, using the drivers graphics card control software. Are you going to use it for HDTV Playing, & or tuner TV recording? I recommend a 64-Bit OS. It makes the video playback smoother. and it gives it that "fluid" motion effect, where it doesn't show any flicker. how good a deal it actually is for me. ... and what about the Magicjack, will it give any troubles or need special considerations? What's your opinion, from the ones with more knowledge here, about the T5730? My personal opinion, only, but I think this is a good deal. The t5720 is a terrific thin client that can do an amazing number of things. If all you want to do is run a MagicJack, it won't make a difference, but if you're interested in other applications, I'd take the t5720 deal. no matter though, you think the upgrade is a good deal by the tone of your excitement, thinking a T5720 trade would be great. and I'd have to send all of my T5710 stuff back for the exchange. I know the RAM module is different, again, according to the Kingston site. which brings up the point of the extra wattage usage... even at idle. is the T5730 faster anyway, because it has a larger FSB ??? because the MagicJack needs to be connected all the time...! so, I'm still undecided.... this is why I need more input, (info) about it. Just going by purchase price, this is a heck of a deal. The cheapest I've been able to get t5730s for is $250 on eBay -- most are in the $400-600 range. I've got a bunch of t5720s and two t5730s. The biggest advantage of the t5730 is the built-in gigabit NIC and DVI video port. If you want to stream video, make a PVR or do anything involving video, this is the way to go. With a t5720 (and t5710) you get only a single PCI slot -- that means either a DVI-equipped graphics card or a gigabit NIC -- not both. The t5730 supports the 8 gigabit flash ROM from Transcend. I've got one on which I've loaded full XP Pro (in fact, I'm using it to post from right now). Frankly, I don't think the 2/10th of a gigahertz difference in CPU speed makes much of a difference. They're different processors so, without knowing the efficiency of each, it's really impossible to benchmark them just on the numbers. I'd have to open one up, but I'm pretty sure the flash RAM isn't soldered. Unfortunately, I'm off to China early tomorrow for three weeks, so I won't have a chance to do this 'til I get back. It should be in the specs somewhere, I'd think. I'm fairly sure the FSB is 133 MHz. Hang on a sec -- okay, just checked. Aida32 reports a 200 MHz FSB. Aida also reports SODIMM memory -- I suppose that still could be soldered, but I wouldn't think it likely. Oh, one other nice feature of the t5730: the expansion slot can be either PCI or PCIe. If you're ever tempted to set up a RAID system using eSATA drives, it's easy (well, relatively easy) to do with a PCIe card (I'm running a terabyte RAID system on this one). You could always take the t5730, sell it on eBay and buy 2 or 3 t5710s. does it always take the full 50 watts, or does it depend on what's inside? it may be several months before I add the other functions, and didn't want to have it draw more power and have less things being done by it. It's going to be my Internet link, and MagicJack support computer, for now, so it's light duty at first. ... I'd hate to be drawing 50 watts for so simple a task.... that's why the T5710 was so interesting... under 10 watts, maximum. but i do admit, the extra upgrade-ability is a temptation for my added PVR and Video server use. I may actually keep it if HP can find the PCI/PCIe Expansion Kit, and includes the higher wattage power supply. So I'd also have to get new memory? ... can it handle 2GB of RAM ? I'm glad the FlashDrive is the same. if the RAM is replaceable, I may keep it and not sell it on eBay. it would only further delay my use of MagicJack and my other uses for the thin client. Hey, PTravel, I recently discovered some wild info facts about the T5730. There's a board layout trace pattern area for a second RAM socket. You'll also need to get a higher wattage power supply block for all these additions. But here's something I didn't know ... There's an on-board PCIe 16x v1.1a slot there already. You can use a PCIe x16 graphics card in x1 speed, if you cut-off the back plastic section of the HP PCIe x1 Riser-cards socket, that's keeping a full-sized card from fitting in. Read more, in the posts dealing with each point. Ask something if you're not sure, before you mess it up. I already confirmed the 2.2GHz Dual-Core 64-bit Turion x2 CPU works. I tried a 2.4 GHz speed of the same model CPU, it worked, but the CPU may have been defective because it shut down shortly after. I sent it back for a replacement. The 2.2GHz CPU is still working ... And I have the system playing 1920x1080i to my monitor, smoothly, at full screen... using the Dvico USB Gold Fusion5 HDTV tuner. I also was able to install Windows7 64-bit, and it fully worked, but when the defective CPU crapped out, it did something to win7 and I wasn't able to install again, but the WinXP Pro, full version is in, and working, on a 320GB Western Digital 2.5 inch Hard Drive, using a Female-to-Female 44-pin IDE cable, in place of the Flash Drive. Now I'm going to try a EVGA 7600GT PCIe card, and I've purchased a 12vdc 16 amp (192 w) power supply brick to support all these new additions. I have the 7600GT card ($20 + $4.99 s/h) from EVGA B-stock section. And I've located a flex-riser adapter for the PCIe 16x slot ... But still have to try this all, when the riser card comes in. I had to modify the power supply connector area on the T5730, adding wires and a 4-pin plug to attach the 16 amp PSU. Many pictures were made so far, but I'm waiting to see if the 7600GT works. All this will be posted on the EVGA forum, and maybe here too. With the faster CPU and the Dual-Cores, the CPU usage doesn't go much past 50% while playing the HDTV 1080i out from the DVI ...also dual monitors are supported now too... But don't want to press it. yet! Playing AVCHD works too, but plays slightly slow, most likely because of the built-in graphics limitations... This is why I want to try the 7600GT, but don't know if the BIOS will complain, or the mobo will give the maximum of 75 watts from the PCIe socket. This was where I got my hints. The ground lines don't match-up to standards in other motherboards generic in design, along with the signal and other voltage lines, so, standard PCIe 16x risers won't work unless a custom riser is made. One thing I should mention, the company I got these risers from was very nice dealing with this issue, sending me new risers to try at no cost to me. I've offered to pay them for their troubles, and asked if they'd be interested in designing a custom HP "style" riser, using my original HP PCIe x16 to standard PCI 32 slot card to compare theirs to the HP risers wiring at the PCIe side. We'll see how that goes But you never know ... They're REALLY a very nice place to purchase from, given what they put-up with regarding this issue. Oh...BTW... All the other mods worked, remember? ... Now I'm going to put the replacement 2.4GHz CPU in and see if that's good too. But my point is, the ThinClient can now be a serious computer, without the magic jack to take it over. And better than where I was several years ago, ... I take back saying Future-Nine was any good, they're babies compared to Callcentric. Anyway, the T5730 is now a Dual-Core @ 2.4 GHz it runs the Dvico HDTV tuner at full screen and records to the built-in 320GB Hard Drive... VERY SMOOTHLY. So it's now my Digital Video Recorder for HDTV shows. I'm going to add the extra RAM socket for allowing two(2) separate 2GB dual-channel RAM modules... It may even be able to handle 4GB chips for a total of 8GB in dual-channel. I even had Windows 7 pro 64 running on it with just the 2GB one module. But the graphics chip, (on-board) holds it back from a better win7 rating. if I can get the PCIe non-standard HP 174-pin socket re-wired with a new riser adapter, I'll be able to put the EVGA 7600GT PCIe graphics card in. That means the CPU will not have to work as hard, and more can be done with the T5730... a "Smart HDTV" can be made out of it, plus a full REAL computer, and not just an Internet device. HP didn't tell us everything the T5730 can work with, and with the limitations of the small OS , Flash Drive, RAM, slow CPU, and limited Graphics it's really only good for the old magic jack. I can even use it now to stream full speed HDTV video and audio, to my iPad2, using an App on the iPad2, and a video streamer server program on the T5730, anywhere in the house locally , or over the public Internet. Hey Momo, I have a T5730 myself which I've been messing about with alot recently. I found this thread after googling for dual core cpu's, so I'm glad to find that I can put one in this. But regarding the pcie x16 slot, it's actually just a combined PCIe x1 slot and a normal PCI slot into a x16 shaped slot. I'm going to take a guess (as I have no riser to prove this) that the x1 pinouts should be correct, but the other half of the slot has been rewired for the official HP legacy PCI riser. I hope I've helped you as much as your findings have with me! Hey Weznezz thanks for your post. That's why I'm editing important posts in this thread, to say so. Remember, when/if you do get the dual-core CPU you'll also need a more powerful power supply. and a fan near the bottom, on the inside or outside blowing across the lower heat-pump fins. The EVGA company seems to have changed their Forum links. ...and I suspect all others to their site that may be in other posts within this thread. but all of the important info about this Mod, is here. This second thread link has a picture of the standard PCIe x16 slot riser card, and the HP PCI 32 slot riser. because the ground pins and some power pins are in the wrong place. and the on-board trace pattern for a second one, to add. so no mod to the mobo's board is needed. I posted there, under the name NewestUser. I still think it may be, at least, an 8x PCIe slot. I'm trying to get the schematic, for the motherboard, to be sure. I haven't posted all the pictures regarding the mods, but if more readers are interested, maybe I will post more about it. 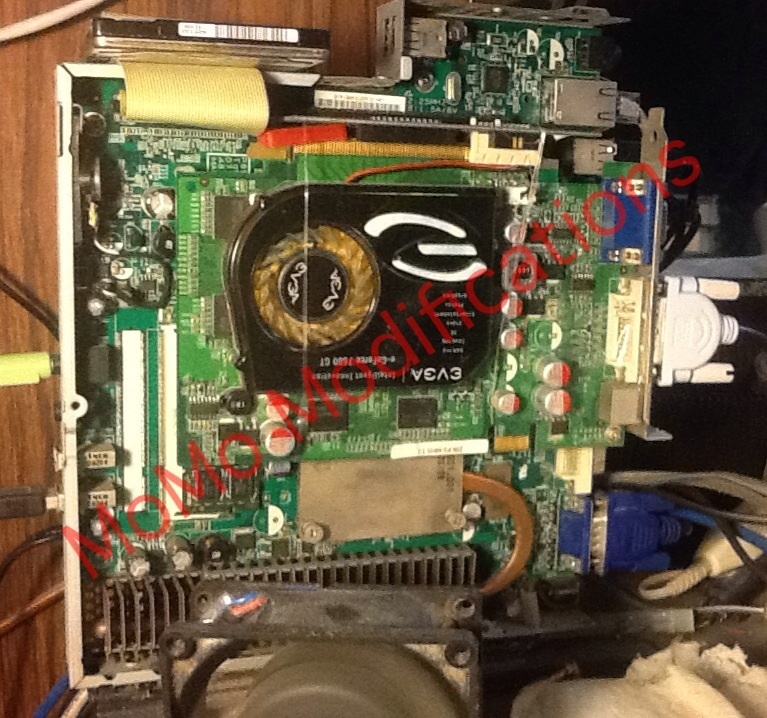 Posted: Thu Mar 08, 2012 5:19 am Post subject: T5730 DDR2 240 pin 2GB - who makes it? Very interested in the T5730 mods you've described. My T5730 came without a power supply, so...I changed polarity on a 12v/3.5a orphaned supply to meet the need. Planning for a 2.2 GHz upgrade (your notes), using the Turion mobile dual core CPU. I currently have 1 GB, but I'm very interested in your memory upgrade. You mentioned the second socket solder pads on the m/b - I see them, but maybe later. But I see you are currently running a 2 GB configuration. I don't find any 240 pin 2 GB SO-DIMM modules listed on eBay. Which module / PN are you using? Last question. You mentioned in a previous post that with the CPU, etc. upgrades, a stronger power supply may be needed. I don't plan to add any PCI/PCIe cards, just the 2.2 GHz CPU, and hopefully, replace my 1GB with a 2GB (goal is online streaming for audio and video, no local storage). I figure my current power supply is 42 watts (P=IE, so 42 watts = 3.5 amps x 12 volts DC). Is there a way to KNOW how much power would be needed to drive the CPU/memory upgrades alone, and, will it require an external fan, or can I squeeze a smaller fan inside the case (prefer additional internal heat-sinking if possible to avoid the fan noise / power use / opportunity for mechanical failure)? I bought and installed a good used 2.2 Ghz x2 Turion mobile CPU in my system, with a clean dollop of new heatsink compound. I find it is warmer than the stock 1ghz, but reasonably cool even without a fan...as long as there is plenty of space surrounding the case. My somewhat 'super-stock' 12vdc 3.5a AC adapter runs fine with the new CPU (my early conclusion after 4 hours non-stop video). I found the installed memory module is 244 pin ddr2, 1gb (Hynix 1gb 2rx16 pc2-5300s-555-12).. (To the first modder, I'm guessing you just tried a random 2gb module that fit, and luckily the chipset recognized it?). I've seen 4gb modules for simmilar spec modules on eBay, but doubt XP (or my watered down XPe) would fully take advantage of it (I'm also too cheap to buy it for a 'try' at about $50 !!). MagicJack (original) barely uses any CPU overhead, even though my 2.2 Ghz sees only one of it's two cores. Solid stable sounding calls via my LAN connection. Hoping to supplement XPe with needed files to enable the second CPU core. Otherwise, I have an unused MS XP with license, and could go the route of a tiny HDD upgrade to run that. Prefer to keep it solid state if possible. May explore the route of using a CF card (unlimited writes, per warranty....) and adapter. Hi kieths, I replied to your PM as well, but figured I could also post my reply here since its good info for everyone to see too. I'm guessing, the main reason the second core isn't being seen is the RAM limit you have now of just 1GB. If not also the limited XPe. *** are you SURE the installed memory module, on yours, is a 244 pin ddr2...? *** mine was a 200 pin. Here's my PM post with all the details. ... For all to see. Please ignore the redundant bits of it that may not address the facts you already stated in this public post, I didn't read this area before I answered your PM. I'll look-up the module number I have for RAM and get back to you soon. As for the power supply ... The best choice, minimum, is 75 watts, just to be safe, even without the other mods. I'll get the 2GB module number for you, so you can try that too, first, before sending back the CPU. I'm not sure you've understood the entire upgrade I did to my T5730. The second core may need a minimum of 2GB of RAM, to be seen, plus the full version of XP. (I'm not fully sure of this, I read it, and I was lucky enough to have already had the 2GB module) ... I was also planning to put the other socket for RAM on the board, to allow an additional 2GB module, (total 4GB), but haven't gotten around to this more time consuming end of the MOD. Besides the XP Pro (sp3) full version 32-bit just seeing around 3GB of the 4GB anyway. Plus, I also hope you've updated your original power-pack from the T5730. It's wattage was too low to reliably power the unit with the new CPU. As well as some kind of small FAN blowing air thru the system for removing the extra heat. Did you check the device manager, hardware view, to see if XPe shows there's a new CPU now? You may have to allow the flash drive to update, without holding back drive writing, by enabling drive writes, for the CPU update, when you reboot. I'm also not sure if the XPe will allow this, but it's worth a try, since its free to try it. If you know how to bring up the area of the device manager, where all the systems hardware shows, with the drivers, ... You can simply click on the CPU line, open its "properties" and do a driver update thru the Internet. If you don't know where to look in the device manager, or how to get there, or the procedure to follow to update the driver files, just ask. I'm also not sure the limits you still have on the T5730 will allow this all to work, but it's worth a free try. Please let me know your outcome, or, if you need any additional help. It was because of your posting(s) that I tried mods at all against the T5730, in fact the reason I got the T5730 at all, having started with just a 1ghz/1gbr/512mbf T5720. I'm at a crossroads at this point. I want to use the T5730 for video streaming onto the tv (DVI->HDMI->TV), but it's too slow (can't even play Youtube's Popeye 1rst episode smoothly). So I followed your lead, and upgrade the CPU, Turion 2.2 Ghz Dual core to replace the Sempron 1 Ghz. I'm seeing the CPU as single core, and clocking at about 1.9. The speed doesn't bother, but the missing second core does. I've read about the ways to overcome the missing second core, and prefer not to change out the OS...just yet. I would prefer to add in the missing files to enable the second core, if that's possible. Have you successfully patched / supplemented missing second core file to make a factory XPe image recognize and run correctly? I would like to have a list of known missing files, if that's possible. I believe some may be hard to locate, but I do have a few computers around here...each with a licensed installation of XP. Perhaps they can be my source. MJ does run on my older T5720, though with very limited left over space. The 512MB flash, I would guess, is about the minimum one could run MJ on. Perhaps I've left in some O/S baggage that's removable, but it's pretty much full with MJ. A faster memory module part can be used, better than this one. The memory links below are outdated, and wrong anyway. Simply search for 200-pin DDR2 SDRAM PC2-6400 memory that's 800MHz speed. This will give you a 400MHz actual speed. *** if yours IS 244-pin ... the one I listed won't fit. Just as an example. ... Others may have it too. Try Pricegrabber.com too. They'll search many other sources as well. The Kingston brand of this module has a lifetime warranty. But if you try another brand, I don't know if the specs are the same. It should have a total of 16 chips on the module (8 on each side). I'm trying to find my receipt for the place I got the power supply from. They had lower pricing than anyone else for a range of wattages suited for this application, without needing modding of the connector, as I had to do for my higher wattage PSU. When I find that source, I'll post it too. If your PSU isn't getting too hot, you may be OK, but it's working at the near maximum wattage it can give. So if it doesn't blow out soon, it's really being "stressed" and will shorten its life, in the long-run. Remember, one CORE isn't "ON" so it could be fooling you to think its not taking the full wattage it really will use with both cores running, plus the streaming HD video later on. When you find out what's keeping the other core "OFF" and finally activate it, the wattage will rise, and the heat will too.! Both on the PSU, as well as the CPU... So a fan will ultimately be needed. You'll also need to keep the GPU cool, in case you've forgotten about that chip, on the motherboard. (the other large heatsink) Think of using a FAN, sooner than later.